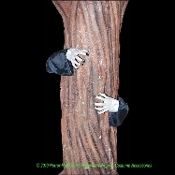 Pair of realistic life-sized creepy bendable zombie arms that wrap around a tree with a nylon strap so it appears as though a scary creature is reaching around the tree to get you! Spooky yard cemetery graveyard indoor and outdoor haunted house yard decoration. Posable black fabric covered sleeve over padded wire monster arms, with ghoulish gray hard plastic molded hands. Flexible body part fits tree, fence pole, support post, tombstone, small furniture or body up to 61-inch (152.5cm) circumference. Makes a funny gag freaky cosplay Halloween costume monster attack prop accessory, too!